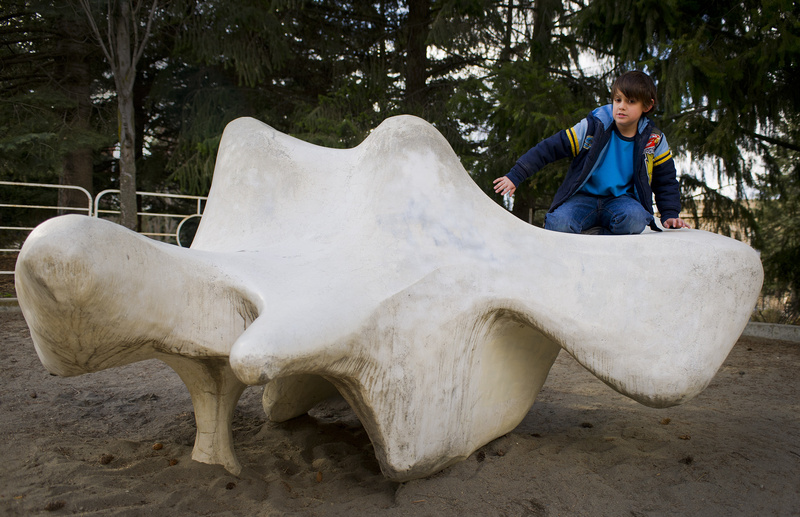 The unnamed piece, by Charles W. Smith, has been labeled “dinosaur bone” by parks staff. Park officials argue that the sculpture is not an accredited piece of playground equipment and attracts children to play on it because it’s located in a playground. Officials said they doubt it could be moved because of its condition. Last week, park officials predicted that the piece would be thrown away. But Park Director Leroy Eadie said today that the city will make an effort to transfer the work to a “mission-related institution” and that if none of those are interested, to a private individual or business. In 2007, the City of Seattle refurbished a similar Smith sculpture from the early 1960s in a city park. The man who fixed the Seattle piece said last week that the Riverfront Park sculpture likely could be fixed. The Park Board will meet at 1:30 p.m. today at Spokane City Hall, 808 W. Spokane Falls Blvd. In a letter to the board dated Wednesday, Spokane Preservation Advocates, a nonprofit group that supports historic preservation, requested a delay in the decision to remove of the sculpture. “We believe that this work may be both a significant artifact of Expo ’74, which was a seminal event in Spokane’s history, and a significant work of art representative of the period,” said Matt Cohen, president of the group, in the letter. Smith, a University of Washington art professor, died in 2009. He intended children to interact with and climb on the Expo sculpture. His son, University of Maine Art Professor Owen Smith, said his dad crafted about 20 to 30 “large-scale” works of public art throughout the Northwest. Published: April 13, 2011, 6:20 p.m.